The last day of our trip ended with a bang or might I say a roar. 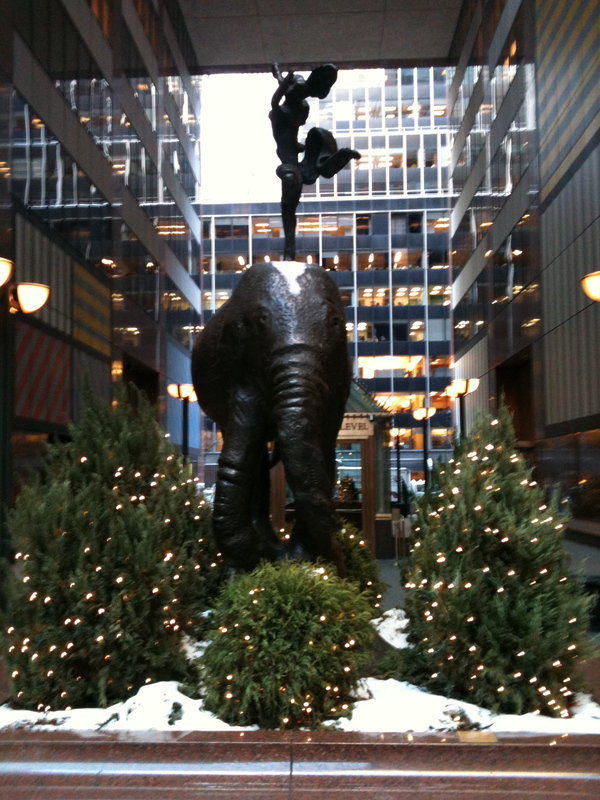 Before departing the Big Apple we stopped by Discovery Channel Headquarters in NYC to meet with Brian Eley Director of Communications at Animal Planet. Brian spoke to us about the usual internship opportunities and what the company does, however there was one notable difference: every single of us wanted to work there. That might be an overstatement, but it was definitely the mood in the room. What is fantastic about Animal Planet and Discovery Channel is they offer a multitude of media careers and having a growing audience. It’s hard not to want to work for a place where there are so many different opportunities and a bright financial future. Also, after hearing how well Brian prepares his interns to work in the field, we were all eager to hand him our resume. Obviously not all of us will end up at Animal Planet, but this was a great way to end our trip. Though the week was fun, we all learned some tough lessons about the industry and gained a lot of insight. It was nice to be able to end the week on a somewhat lighter and happier note. On my way back to the hotel to pack my bags, I noticed this statue. Maybe it was just a coincidence, but I think it was a sign. Needless to say I plan to apply for the internship at Animal Planet. P.S. The blog will continue! Keep checking up on it these next few days. After our visit to MTV networks and a quick cup of coffee we headed over to the Chase Financial Building to visit Canoe Ventures a media corporation headed by UVA alum David Verklin. Unfortunately Mr. Verklin had the flu and was unable to meet with us. Regardless, his staff was eager to tell us about the start up company and get us all excited for the future of television. Few people at this point have probably ever heard of Canoe Ventures, but I promise you that is about to change. Canoe introduced us to interactive television and I don’t just mean video on demand or DVR. Canoe is working with Comcast and other cable networks to bring both interactive commercials and programming. Imagine being able to vote for what guest stars you want to see on SNL or being able to request a free sample of Febreze anytime you see a commercial for it, well I promise you it’s coming. At first I will say many of us had a sort of suspicion of Canoe. 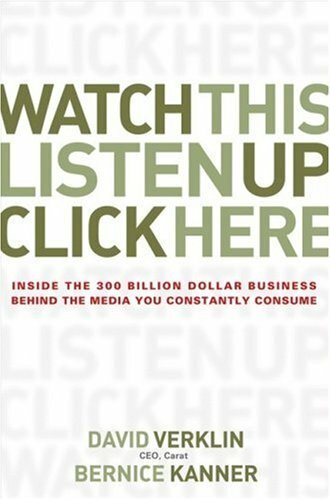 A large part of what we learn in Media Studies is about the sometimes troubling results when big money gets involved with new media. However, I personally felt like Canoe sensed their responsibility to both their clients as well as consumers (let me express that this is specifically my opinion and I do not speak for the entire group). Though we didn’t get to meet with Mr. Verklin his ideas were absolutely present throughout the meeting. His employees consistently quoted him and spoke about his vision throughout the meeting. My favorite of the quotes was “why watch a cat food commercial when you have a dog.” Mr. Verklin and Canoe Ventures are obviously in the business of making money, let’s be honest it’s kind of a necessity in most fields of media, but there is a sense that they feel it is their job to give the consumers something better. At the end of our time at Canoe we were all given Mr. Verlin’s book “Watch this Listen up Click here”, which he personally signed. Though this was the trip that probably caused the most disagreement among my peers and I, it was a treat to be able to visit Canoe. Personally I believe that Canoe is making history and would love an opportunity to intern or work at a company such as this. As a film and TV buff I imagine making programming more exciting, less passive, and giving it cultural depth. We may not all agree but I think we were all impressed. Also look out for a post in the future talking a little bit more about Mr. Verklin. He is a huge supporter of the Media Studies Department and really believes in what we are doing. Also, make sure to keep and eye out for Canoe Ventures! Though the trip is over, we did so much that I just didn’t have time to blog about everything we did on the trip. So, expect a few more updates the following days. I like to think of it as a kind of metaphor, just because we left NYC doesn’t mean it left us, and so the blog will continue! Yes I am a fan of cheesy puns if you couldn’t tell and I understand that this is one of my worst ones. But honestly it’s about as accurate as they come because when we went to MTV networks, we were greeted by not one Media Studies grad but two, and two other recent UVA grads, and another UVA grad from back in the 80s (back when MTV was, believe it or not, mostly music videos). It was a huge opportunity. It’s pretty astonishing having that great of a job network at a major media corporation as enormous and as famous as Viacom (MTV’s parent company). We got to hear some fantastic stories, ask tons of questions about everything from TRL to the work environment and even had a couple of drag queens run through the lobby (apparently they’re filming a new season of RuPaul’s drag race on LOGO). One of my favorite portions of the presentation was the pro-social causes that the network supports. Among those is a show that demonstrates the academic background of artists like Ludacris and Keri Hilson, both straight-A students back in their younger days. This particular project is supported by the Bill and Melinda Gates foundation. Fellow major Matt and I were disappointed to hear that our favorite program on the station TRL (Total Request Live) was not coming back, but it was still an interesting opportunity for us, especially Matt who is incredibly interested in digital media and music. Viacom is also the parent company for Nickelodeon, so I’ve included one of my personal favorite music videos and a clip from my favorite show on Nickelodeon. If you’d like me to add one of your favorites, leave a comment and I’ll add it on. Though we learned briefly about what Thomson-Reuters does, they’re a news aggregator similar in some ways to Associated Press, Reuters served as a great opportunity to hear about the reality that is life in NYC an the media industry. Preston Gisch, a 2007 Media Studies graduate, talked to us about payless internships, low salaries, high rents, and getting your foot into the door. It was honestly a bit depressing, but I think it was something we absolutely needed to hear. Also Preston ended the conversation on a positive note telling us about the satisfaction of settling into the industry and the city. It was a worthwhile experience for sure. Professor Bodroghkozy let us all know at the end of our visit that Preston would be a great mentor for any of us wanting to work and live in the city after graduation. I guess he’ll be getting a couple friend requests tonight. Who knows? Maybe one day Times Square will be our new Academical Village. 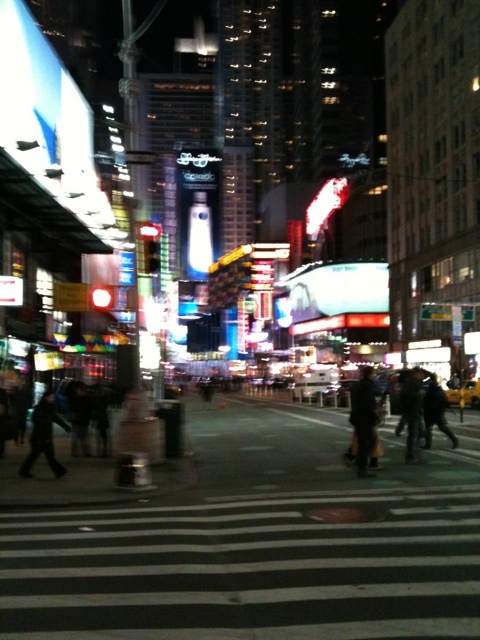 So unfortunately Internet is not cheap and difficult to find in NYC so I’ve been using my iPhone to blog. I apologize for all formatting issues and media problems. I’ll hopefully have them all fixed tonight. Hope you’re still enjoying the blog. 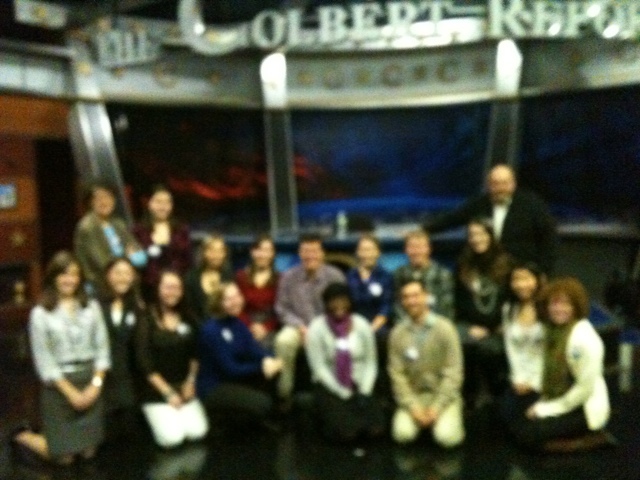 Colbert was absolutely the theme of our day. Not only did we see how the intro to his show was made, but we also got meet with him in person for a Q&A and I personally got to go on his show. Unfortunately, Mr. Colbert personally asked that we don’t share anything from the Q&A since he was out of character and spoke frankly and personally to us. However, I can say two things: his character is the legitimate center of the universe and we may have begged him to speak at 2012 Commencement… We’ll seewhat happens. As for the show, it was out of this world! The comedian was fantastic at the beginning of the show. His job was to warm the audience up and after finding out that Njeri, a fellow major, was from Kenya and a Media Studies major he decided he would use her and the rest of us as material. Njeri was a great sport and so were we as he teased us about our major. Maybe he should take a Media Studies course with Professor Bodroghkozy before he dismisses our major. Then came the main act: Stephen Colbert himself. Though I am not a regular viewer of the show, I had an amazing time and felt like I had been watching the show forever. Stephen really made the audience feel both comfortable while putting on a wild show. The highlight of the show was absolutely Stephen’s guest, Bernard-Henri Lévy or Bernie Hank as Stephen endearingly called him. Lévy is a French philosopher who recently wrote a book with another French philosopher from the opposite end of the political spectrum, Michel Houellebecq. 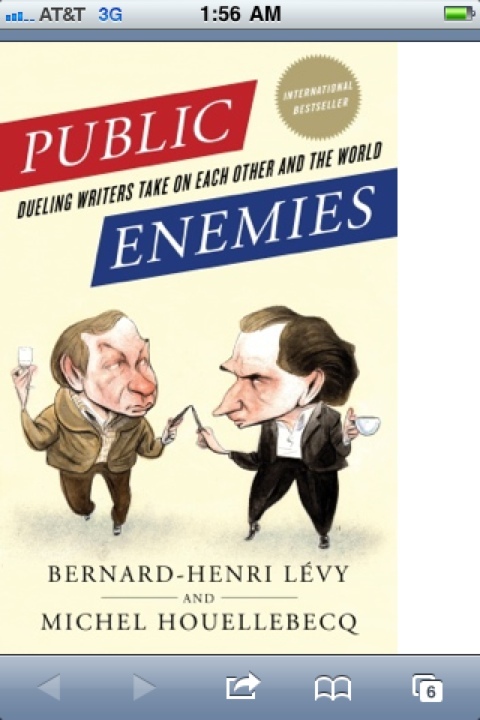 The name of their book, which serves as a sort of debate between the two, is “Public Enemies”. Colbert and Lévy were incredibly dynamic together, so much so that their conversation went on for 15 minutes instead of six. They touched on everything from intellectualism to Hurricane Katrina to American Radicalism compared to European Rationalism. Sadly not all of the conversation was included in the actual episode because time limitations. An entire story had to be cut. I promised myself I wouldn’t do this because I want this blog to be fun and not too technical, but I have a quick Media Studies nerd moment. I have to say seeing so much great material from Colbert get cut from the actual show made me incredibly disappointed with the American Media system. The show is both limited by the structure of television programming and advertising (30 minute time slots including 8 minute advertisement). The form of this content limits the value of the content. If we have this model the viewer would presumably benefit from the additional material. Of course I could go on for hours about limiting discourse in the public sphere and embedded vs. inherent media, shout out to my adviser Professor Petersen, but I’ll leave it there. One last thing, Stephen asked me to give this disclaimer: he is perfect and did not make a single mistake all show, it was the greatest experience our lives. Below is a somewhat blurry picture of us with Stephen, as soon as I get home you’ll get to see the good picture Kristin took. Also check out the clip below if you’ve never seen Stephen’s work, he really is a great performer.